[REMINDER] Don’t Miss Diarrhea Planet & JEFF the Brotherhood w/ Ranch Ghost | Halloween @ War Memorial Auditorium! As we previously announced, two of Nashville’s best rock acts, Diarrhea Planet and JEFF the Brotherhood, are teaming up to bring you a Halloween night concert that’s sure to be scary good. DP’s first hometown show of the year, and JEFF’s first since the announcement of their forthcoming LP (which will be available for sale two weeks early at the merch table), the bill also features Ranch Ghost, and tickets can still be had for $20 (or $10, through a special Two Boots promotion). Individually, JEFF and DP boast some of the best live shows in town; together, they’re basically unstoppable. Add in costumes, Halloween vibes, and one giant room, and you’ve got what might just be the best show of the whole weekend, if not the whole year. Read on for more! If you haven’t yet seen the live spectacle that is Diarrhea Planet, you’re pretty much failing at being a Nashville rock fan. Fortunately, the group’s Halloween outing, their first hometown show of 2015 (how is that even possible, you ask? so much touring), promises to bring enough over the top rock and raucousness, it’ll more than make up for it. With a four-guitar arsenal, the band have ascended from their poppy, anthemic, punk and party rock early days to an internationally lauded rock powerhouse, thanks, in no small part, to their unbelievably great 2013 LP I’m Rich Beyond Your Wildest Dreams. Since then, the group have dropped an EP, and are currently hard at work on new tunes. We expect their next full-length to not only land the title of best Nashville album of 2016, but, given their nonstop touring, more serious (not not too serious approach), and increased national presence, it might just be one of the best records of next year period. Diarrhea Planet are the best of what Nashville has to offer, and Halloween or not, you should never miss a chance to catch them in person. One could make the argument that without JEFF the Brotherhood, there might be no Diarrhea Planet, a sentiment that could apply to any number of local rock and roll up and comers. Bringing grungy, fuzzy, garage rock tunes to Music City long before it was hip, the band of real life brothers have been going strong for well over a decade, and their own Infinity Cat label has facilitated the growth of the scene that brought us DP, Daddy Issues, Natural Child, Pujol, and countless others. After a short major label stint with Warner Bros., JEFF were released from their contract earlier this year, allowing them to put out would-be major label followup (and eighth LP) Wasted on the Dream themselves. Seemingly liberated by their return to indie status, the duo (who, these days, perform live with a full band), are already gearing up to drop another album, this time a double LP, Global Chakra Rhythms, next month, Nov. 13. Check out a new track below, and be ready for a mix of new tunes, old faves, and JEFF’s signature rowdy, magnetic live presence on Halloween. Another long-time Nashville fixture, Ranch Ghost have been tasked with kicking off this incredible night of local tuneage, and their pedigree makes them more them up to the challenge. With a handful of fantastic releases and through countless performances over the past few years, Ranch Ghost, with their ’60s-infused, psychedelic, and surf rock tendencies, have become one of Music City’s best under the radar acts. Show up early and see what all the fuss is about. 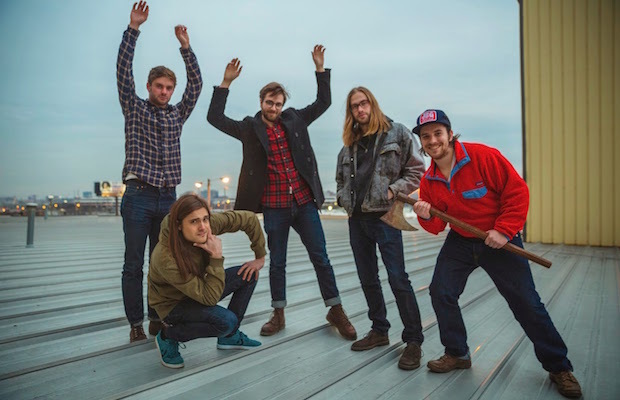 Diarrhea Planet, JEFF the Brotherhood, and Ranch Ghost will perform Halloween night, Saturday, Oct. 31 at War Memorial Auditorium. The show is all ages, begins at 7 p.m. (doors at 6 p.m.), and tickets are available for $20. Tickets Still Remain For The Delta Saints, The Lonely Biscuits, *repeat repeat & More at Marathon Music Works Tonight! Weekend Roundup… check out these shows.